Our Under 8 girls began the evening with mini-matches hosting St Mary’s Rosslare, with some great skills shown by both sides. Our Under 10 enjoyed a fun training session, while our Under 12 girls had fun and mini games on the astro-turf inside. Then all teams, Parents and Managers made their way upstairs, Chairman Alan Aherne, opened the evening, thanking all the girls and their Parents and the mentors for their hard work. Our very own Kate Kelly, took some time out from training, to present the medals, starting with the Under 8 girls, their team manager Catherine Roche, and mentors Rebecca Corrigan and Linzi Lanigan were on hand to help out and photo’s were taken. Following with the Under 10 girls, and their Manager Austin Hearne, and helpers Sheila Roche, Stan O’Leary and Paddy Campbell were present. Under 12 girls were then presented with their medals from Kate Kelly, while Team Manager Tom Tynan called the names and said a few words, and thanked Angie Kinsella, Trish Fielding, Andy O’Connor and John Banville for their help through the season. All the girls were delighted as each received a goodie bag, and tea and coffee and biscuits available for the Parents and mentors. A lovely evening was had by all. We look forward to seeing you all for the 2015 season! in their mini-league Final 5-0 to 3-0. 17 girls togged out namely Keeva Campbell (1-0), Grace Harding-Kenny, Danielle O’Leary (1-0), Nicole Gillen, Eimear Flanagan, Emma Flynn, Anna Dempsey, Rachel & Sophie Denby, Shonagh Tobin, Caoimhe Tobin, Ava Watters (1-0), Lucy Roche, Niamh Hearne, Saoirse Banville, Clara O’Leary and Rebecca Fanning. Mentors Austin & Emma Hearne, Sheila Roche, Stan O’Leary and Paddy Campbell. Well done girls we are so proud of you all! In Hollymount yesterday evening when 19 girls togged out. There was superb skills displayed by both teams. Well done to the players and their mentors. over St Martin’s yesterday evening in Hollymount 3-2 to 2-1 in the mini-league Final. A brilliant end to a great season of camogie. Team as follows: Aoife Doyle, Nicole Harding-Kenny, Catie Byrne, Amy O’Connor, Becky Halligan, Hannah Hearne 1-1 (1-0 play, 0-1 free), Ciara Banville, Andrea Fielding 2-1, (1-0 Free, 1-0 ’30 & 0-1 play), Aoibhe Murphy, Katie Feeney and Mai Ling Tynan. Subs: Beth Byrne, Sophie Byrne, Abigail Gillen, Erin Kehoe, Ciara McMahon, Caoimhe Parker, Lily Stoutt, Sophie Whelan and Nicole Gillen. Also Sinead Banville, Aoife Hearne, Ellie Doyle, Kate Murphy who were unable to attend. It was a well battled game by both sides, alot of pressure on our defence, and St Martin’s opened the scores with a goal in the 15th minute. Ibar’s girls got back into the game when Andrea Fielding netted a well-taken free in the 18th minute, leaving both sides level. Andrea’s next score put her team ahead by a point from play after winning the Martin’s puck out. Ibar’s kept the pressure on Martin’s defence, great play from our forwards Mai ling, Aoibhe & Caoimhe who came on for Katie Feeney in the 16th minute, won Ibar’s a ’30, taken by Andrea who netted it, this gave a halftime score 2-1 to 1-0, after playing with a strong wind. Ibar’s resumed the second half with some changes made by the mentors, the girls played very well, with Hannah Hearne increasing Ibar’s scores with a fantastic goal from play, after fine passing from her team mates Nicole & Becky. Martin’s got the next score, a point, and Sophie Whelan went on for M Tynan. Our defence kept up the great clearances from Catie Amy & Aoife, with great saves from Ciara Banville in goal. Hannah pointed a well-taken free, Erin Kehoe on for C Parker, Martin’s finished the scores with a goal, leaving the full time score 3-2 to 2-1. A well deserved victory for our U12 girls. We played an extra 10 minutes to give all our subs namely, Beth Byrne, Sophie Byrne, Abigail Gillen, Ciara McMahon, Lily Stoutt and Nicole Gillen a run. These girls did fantastic and kept our lead with St Martin’s only scoring a point. 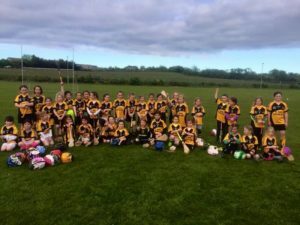 Well done to all the girls, and thank you to Referee, umpires, Wexford Camogie Co Board, a big thank you to Team Manager Tom Tynan, his fellow mentors Angie Kinsella, Andy O’Connor, John Banville & Trish Fielding for all their hard work over the season, and finally a big thank you to the Parents for all their help and support, the girls are a credit to their Parents and the Club. There is no U12 training on Monday, September 1st, due to U14 league semi-final v Rathnure, we wish them the best of luck. Keep Monday, September 8th free as we will finish up our U12 season, more details to follow. when they played a big part in the programme of events at the Liberty Insurance All-Ireland Senior camogie championship semi-final between Wexford and Cork in Semple Stadium, Thurles. It was a special experience for the girls as they assembled in front of the tunnel at the old stand and formed a guard of honour for the Senior teams as they emerged along with Cloughbawn and two Cork clubs, Sliabh Rua and Tracton. While most people in the crowd were looking forward to a break at half-time, the referee’s whistle was the signal for our girls to spring into action as they lined up to play Sliabh Rua in a short mini-game. It was a special experience to play on this lush sward – widely regarded as the best hurling surface in the country – at such an early age. And all of the skills learned in Hollymount since early in the year were put to very good use as our ground striking, hooking and blocking were excellent in the course of a scoreless draw! Our girls who did us proud and were a credit to the club and their families were: Niamh Hearne, Saoirse Banville, Rebecca Fanning, Clara O’Leary, Muireann Lanigan, Keeva Campbell, Danielle O’Leary, Lucy Roche, Grace Harding-Kenny, Nicole Gillen, Anna Dempsey and Emma Flynn. We also must say a big ‘thank you’ to their three mentors – Austin Hearne, Stanley O’Leary and Sheila Roche – who accompanied them, and to Emma Hearne who looked after all of the arrangements to make sure the girls had the best-possible day. We hope this experience will be a big boost to them as they play their mini-league final on Saturday next, August 30th, against opponents to be confirmed, with the time and venue not known as yet. This will be the final official action of the year, and it would be great to end on a high note after so much progress has been made. The girls played two challenge matches during the week, travelling to face Oylegate-Glenbrien on Monday and hosting a very strong St. Mary’s (Rosslare) side two nights later. Keep an eye on Facebook and Twitter later in the week for confirmation of the mini-league final details. Check out St Ibars/Shelmaliers facebook page for photo’s!! produced a great outcome in Hollymount last night when our Blue team won their last game against Shamrocks thanks to a very strong second-half performance. Our club was delighted to act as hosts for the evening, with three finals taking place in all. The fourth – featuring our Red team and St. Martin’s Maroon – was deferred until Tuesday next in Hollymount at 7 p.m. as our opponents have four girls in Athlone at the Community Games finals this weekend. Anyway, back to last night’s action on the small pitch. Shamrocks were our opponents and we knew they would be tough after playing a 2-1 each draw with them in Fr. Murphy Park last month. On that occasion their very tall midfielder did a lot of damage and she was hard to miss again yesterday evening when her team emerged from the dressing-rooms, towering over many of the adults. However, our girls had done their homework very well and closed her down at every opportunity as she was confined to striking off her right side. Time and again our determined girls showed great bravery as they tackled her like demons and gave her little or no time on the ball. This attitude was replicated all over the field, and just one score was recorded in the first-half – a Shamrocks point from a ’30 after 23 minutes. When play resumed that big midfielder had departed owing to injury, but I’d say frustration had a lot to do with it too as our girls had hounded her with their non-stop tackling. Aoife Hearne was brought on in the full-forward line just before half-time and what an impact she made! She hit a superb hat-trick to put us well on the way to victory, rattling the net in the fourth, tenth and 16th minutes. And just for good measure Nicole Gillen, one of the strongest strikers of the ball on the team, added a fourth to leave us commanding 4-0 to 0-1 winners. It was an excellent display, and naturally enough team manager Tom Tynan got soaked by the girls afterwards…it’s becoming a habit for Tom to come home dripping wet after every Under-12 game now! We decided not to present the girls with their medals afterwards as we will hold a special end-of-year night for them instead. Well done to them and to mentors Tom, Angie Kinsella, Trish Fielding and Andy O’Connor who had them in fine fettle for this important game. Panel: Ciara McMahon, Nicole Gillen (1-0), Grace Harding-Kenny, Beth Byrne, Sophie Whelan, Amy O’Connor, Nicole Harding-Kenny, Caoimhe Parker, Mai Ling Tynan, Abigail Gillen, Sinéad Banville, Aoife Hearne (3-0) Sophie Byrne. Hollymount was a hive of activity for the finals as Kilmore beat St. Martin’s White by 5-3 to 1-0 while Buffers Alley saw off Oylegate-Glenbrien by 2-4 to 0-2. A lot of people worked very hard to make the evening a success, with a special word of praise going to Trish Fielding who organised the shop and had willing helpers in Emma Hearne, Mary Rose Newman, Marguerite Murphy and Elaine Hearne. Tom Tynan and Andy O’Connor were instrumental in setting up the pitches, while Thomas and Amy O’Connor gave me lots of assistance collecting the flags afterwards! Mick Lanigan refereed two of the games (Kevin Kehoe of Our Lady’s Island did our one), and it was a real team effort to ensure the evening ran smoothly. There wasn’t one complaint from our five visiting clubs so that says it all, and my apologies if I have omitted anyone who deserved a word of praise. tomorrow for the County Senior camogie All-Ireland semi-final. They have the honour of forming the pre-match guard of honour and then at half-time play a mini match. The girls travelling are namely: Saoirse Banville, Rebecca Fanning, Clara O’Leary, Muireann Lanigan, Niamh Hearne, Keeva Campbell, Danielle O’Leary, Lucy Roche, Grace Harding-Kenny, Nicole Gillen, also joining in are Emma Flynn and Anna Dempsey. They will be in the capable hands of Austin Hearne, Sheila Roche, Stan O’Leary and their Parents. They will leave Hollymount at 9.15 am in the morning, meeting in Semple stadium at 1 pm, guard of honour at 1.30 pm and half time game at 2.30 pm against Sliabh Rua from Cork. The girls are so excited on the venture and we wish them the best of luck and have a great day! Ibar’s Abu!